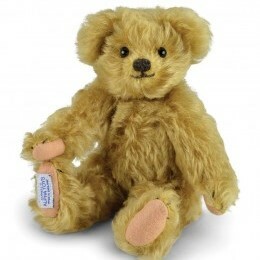 Following the ongoing success of Edward; Christopher Robin’s Teddy Bear, Merrythought is delighted to offer you an adorable, and highly collectible, diminutive version of the famous bear. This charming palm-sized character is a simply beautiful replica of the Farnell teddy bear who famously inspired AA Milne’s Winnie the Pooh stories; Edward Bear. With a certificate and high quality cotton drawstring bag.